Fort Gaines, Encyclopedia of Alabama, Auburn Univ. Fort Gaines was named after General Edmund Pendleton Gaines, a hero of the War of 1812. The fort is located on the eastern tip of Dauphin Island, at the western approach to Mobile Bay. Originally designed in 1818 as the identical twin to Fort Morgan, work on the future Dauphin Island fort was suspended in 1821 when Congress cancelled funding. Although Congress again authorized funding for the Dauphin Island fort in 1846, construction did not begin until 1857. 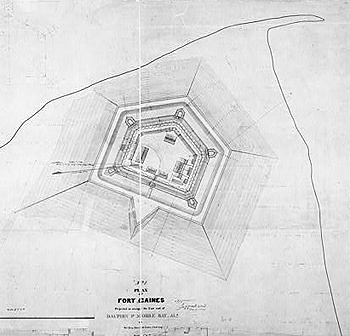 Army chief engineer Joseph Totten then scrapped the original 1819 plans and designed the pentagonal-shaped Fort Gaines using the latest French fortification theory of the 1850s to guard the seaward approaches to Mobile Bay and the eastern entrance of the Mississippi Sound. several years. It remained in Confederate hands until August 1864, when it fell in the same Union attack that brought down Fort Morgan. As with Fort Morgan, engineers quickly repaired Fort Gaines, but it also languished in the years after the Civil War. The Endicott Board recommended two modern gun batteries for Fort Gaines. Built between 1901 and 1904, these batteries housed three 6-inch guns and three 3-inch guns that complemented the modernizations at nearby Fort Morgan. However, with the exception of basic preservation, Fort Gaines received no additional improvements. As with Fort Morgan and other fortifications, its role in harbor defense waned as its guns were outmatched by those on foreign battleships. After World War I, the War Department also sold Fort Gaines to the state of Alabama. It also was activated briefly during World War II and then returned to the state, which opened Fort Gaines as a state park in 1955. Fort Gaines is currently under the management of the Dauphin Island Park and Beach Board and events are scheduled throughout the year. The Battle of Mobile Commemorative Day is held in August, followed by "Colonial Isle Dauphine" in October, and "Christmas at the Fort" in December. Fort Gaines' museum contains Civil War-era historical documents and photographs of the fort's role as a coastal artillery post. Fort Gaines also retains on display eight original artillery pieces from the fort's Civil War days.